Ziegfeld Follies premiered in Boston on August 13, 1945. It was first shown in New York on March 22, 1946, and went into wide release on Monday, April 8, 1946. 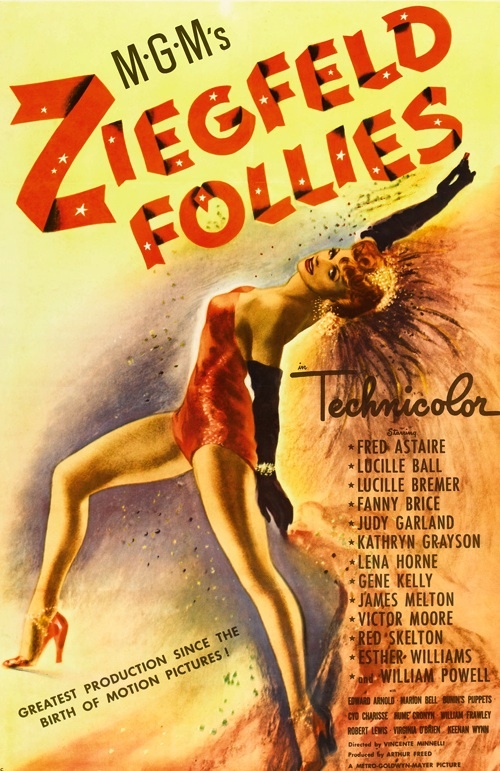 On some theatrical release posters, the film’s title was Ziegfeld Follies of 1946. The film is a lavish, old-fashioned musical pieced together from a big bag of spare parts. It was a pet project of producer Arthur Freed, and was originally intended to mark Metro-Goldwyn-Mayer’s 20th anniversary in 1944, but it went through so many edits and revisions that it missed the mark by more than a year. Despite the studio’s boast on the theatrical release poster that Ziegfeld Follies is the “greatest production since the birth of motion pictures,” I really didn’t enjoy it that much. The musical numbers are hit and miss, and the comedy bits all hit the ground like lead zeppelins. There are a lot of impressive set pieces, and the colors are really bright, but as far as plotless extravaganzas go, it just doesn’t have the latter-day stoner appeal of Fantasia (1940). The film begins with little models of Shakespeare’s Globe Theatre, then P.T. Barnum’s big top, then Florenz Ziegfeld, Jr.’s theater. That’s it, folks. The only three shows in the history of the world that matter. Clearly humility is not on the program for the evening. William Powell, who played “Flo” Ziegfeld in The Great Ziegfeld (1936), reprises his role for the first segment of the picture. He’s on a set that looks like the kind of pad Liberace and Louis XVI might have picked out for themselves if they were roommates, talking a lot of nonsense about magic and the theater (it took me a little while to catch on to the fact that he’s supposed to be in heaven). We’re then treated to an elaborate stop-motion recreation of Ziegfeld’s 1907 opening by the Bunin puppets. All of his great stars are recreated as puppets; Marilyn Miller, Fanny Brice, Will Rogers, and even Eddie Cantor in blackface. Each segment that follows is introduced by a storybook page. Fred Astaire appears in the first, “Here’s to the Girls.” He acknowledges that “Ziggy,” as he calls him, never had much use for villains or plots, then sings an ode to the American girls who were Ziegfeld’s main attractions. Cyd Charisse dances a little solo and then Lucille Ball cracks a whip over eight chorus girls dressed as panthers. Finally, Virginia O’Brien hollers for some fellers, and then sings, “Bring on Those Wonderful Men.” It’s a punishing spectacle that sets the tone for what is to come. In the next segment, Esther Williams appears in … surprise, surprise … a water ballet. It’s fine, and she spends a lot of time underwater, which is neat, but what is the sequence even doing in this picture? Next, Keenan Wynn appears in the comedy short “Number, Please.” I found it completely unfunny, but maybe that’s because I can’t stand “frustrating” humor. Basically, all he wants to do is make a phone call, but he’s thwarted at every turn, until his face is red and steam is coming out of his ears. For me it dragged the movie to a halt like a sweaty punchline comic working the in-betweens at a burlesque strip show. Next, James Melton and Marion Bell sing “La Traviata.” Yawn. Ooh, goody, more comedy! Victor Moore and Edward Arnold appear in “Pay the Two Dollars,” in which a man spits on the subway and is trapped in a legal nightmare because his attorney won’t let him just pay the $2 fine. Again, what’s up with the horribly frustrating situational humor? Not only did this segment not make me laugh, it made me feel as if I was watching a stage adaptation of a Kafka story. Next, Fred Astaire and Lucille Bremer appear in a “dance story” called “This Heart of Mine,” with music by Harry Warren and words by Arthur Freed. It’s pretty good. It took me back to the days when lighting a girl’s cigarette and then dancing while smoking was still classy. On the other hand, no one glides across a ballroom like old Fred, so the rotating circular centerpiece seemed wholly unnecessary. Who did the director think he was dealing with, Clark Gable? The next comedy segment is called “A Sweepstakes Ticket,” and for some reason it’s filmed on a regular set, not the impressionistic “stage” sets used in all the previous comedy bits. Hume Cronyn gives away a winning Irish sweepstakes ticket to make up the few bucks he was short on the rent, and he and his wife Fanny Brice try to get it back from their landlord. Again, it’s not at all funny, just frustrating. The next segment, “Love,” with Lena Horne (R.I.P. ), was a nice opportunity to see black people in Technicolor, and in a steamy tropical setting no less. It should have been longer. Next, Red Skelton shows us all what will happen “When Television Comes.” He does a promo for “Guzzler’s Gin.” He drinks a whole bunch each take and acts more and more stinko. If you’re amused by cross-eyed drunkenness and double-takes, this will still do the trick. Although it’s possible audiences in 1946 were amused by this segment, I can’t imagine they were left with a very clear idea of what the advent of television would mean for the country. Up next is “Limehouse Blues,” in which Fred Astaire and Lucille Bremer return, only this time in yellowface. The Chinatown tropes are offensive, but the colors and imagery are quite beautiful and impressive, in a non-P.C. sort of way. Once we get to the actual dance number, however, the piece is hamstrung by its own ridiculous conceit. It doesn’t help that in all the medium shots, Astaire’s makeup makes him look a lot like Boris Karloff in The Mask of Fu Manchu (1932). In “A Great Lady Has an Interview,” Judy Garland seems to be lampooning Katharine Hepburn or possibly Greer Garson. I got the feeling that there were a lot of industry in-jokes that I wasn’t getting. For me, Garland is always a treat, however, so I didn’t mind it that much. And then, like a terrible party that suddenly becomes fun 20 minutes before the police arrive to break it up, Fred Astaire and Gene Kelly appear in “The Babbitt and the Bromide,” by George and Ira Gershwin. Their dialogue is funnier than any of the “comedy” bits in the movie, and their side-by-side dance number is transcendent. Ziegfeld Follies is worth seeing for this sequence alone. Finally, Kathryn Grayson sings “Beauty,” by Warren and Freed. It’s standard stuff, but there are enormous piles of bubbles that I thought were pretty cool. In other news, the last living Ziegfeld Follies “girl,” Doris Eaton Travis, died yesterday at the age of 106. I hope it doesn’t seem as if I’m beating up on the Follies themselves. I’d love to go back in time and see a Ziegfeld revue on Broadway. This film just doesn’t really capture the magic. Posted in 1945, 1946, April 1946, August 1945, March 1946 and tagged Albert Akst, Arthur Freed, Calvin Jackson, Charles Rosher, Charles Walters, Conrad Salinger, Cyd Charisse, Edward Arnold, Esther Williams, Fanny Brice, Fletcher Henderson, Florenz Ziegfeld, Fred Astaire, Gene Kelly, George Folsey, George Sidney, Hume Cronyn, James Melton, John Murray Anderson, Judy Garland, Kathryn Grayson, Kay Thompson, Keenan Wynn, Lemuel Ayers, Lena Horne, Lennie Hayton, Lucille Ball, Lucille Bremer, Marion Bell, Merrill Pye, Metro-Goldwyn-Mayer, Musicals, Paul Marquardt, Ray June, Red Skelton, Robert Alton, Robert Lewis, Roger Edens, Roy Del Ruth, Ted Duncan, Victor Moore, Vincente Minnelli, Virginia O'Brien, Wally Heglin, William Frawley, William Powell, Ziegfeld Follies. Bookmark the permalink. According to NBC News, not only did Doris Eaton Travis live to be 106, she started dancing with the Ziegfeld Follies at age 14 and “danced right up until the end.” Ninety two years of dancing, not bad.